The new #WorldEmojiDay collection is truly something to behold. July 17 is apparently World Emoji Day because the calendar emoji in most global operating systems says “July 17”. Jeremy Burge, founder of the website Emojipedia decreed the holiday in 2014, launching corporate tweets on the hashtag #WorldEmojiDay and actual events ranging from 2016’s World Emoji Run to Pepsi’s Emoji Red Carpet. In order to celebrate the concept of emojis, GIPHY launched a series of animated gifs it calls “IRL Emojis”. They are captivating, insane, and either the mark of society’s imminent collapse or a lurch forward in the human race’s attempt to topple the tower of Babylon. Much has been written about the history and linguistic development of emojis, and that coverage tends to lean toward optimism. Emoji are the great uniting lexicon, many critics say. The world anticipates not one but two feature films about emojis, and The Emoji Movie is reportedly about the triumph of the human spirit. Still, GIPHY’s holiday stunt feels like the beginnings of a cultural ouroboros. Man created the emoji in his image and saw that it was good. Man attempted to diversify the emoji, bringing them closer to his own image than is typically comfortable. Man moved emoji into the uncanny valley, and now we have GIPHY’s “IRL emoji”. Is GIPHY flying too close to the sun with its new collection, which it filed under “cool stuff”? We’re not sure. We’re 😬. Take for instance the tango dancing emoji woman in a red dress, whose official term is “💃” or “Wn Dancing”. GIPHY cast an actress with dark hair to play her in its looped image. When used on a smartphone, “💃” can mean you’re being flippant about something, or it can mean you’re literally planning an evening on a dance floor. It can mean “I feel fabulous”, or it can stand in for a sarcastic, “I feel like garbage so sending you a fabulous emoji is funny.” Now that GIPHY has turned “💃” into a human woman, its meaning isn’t as clear. GIPHY cast at least 10 people in the roles of humanoid emojis with its new set of gifs, each one more curious and strange than the last. 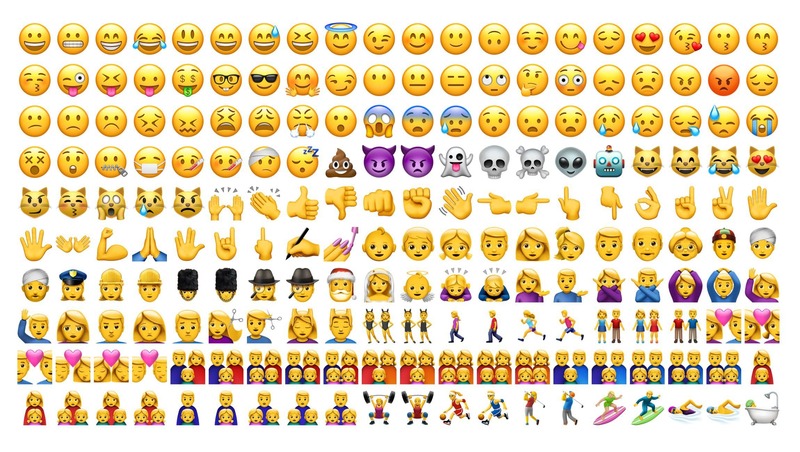 For years, Unicode (the computing industry standard) gave its humanoid emojis yellow faces, attempting to make them look ethnically neutral, and far in design from an actual human face. As comics theorist Scott McCloud writes in Understanding Comics, the fewer facial features a recreation of humanity has, the easier it is for the reader to interpret a face as representative of themselves. Through comic book history, villains have appeared with more gruesome detail, whereas cartoons and comics about characters we’re supposed to identify with tend to use smoother lines and simpler indications of facial features. Amplifying a face's meaning also diversifies the group of viewers it's intended to reach. The foam wig and false eyelashes really adds to the bizarre spectacle here. Again, note the plasticky wig and animated tears. The sense of loss here is so potent. GIPHY even adds its own diversification, allowing the “👯” emoji, called “People with Bunny Ears Partying”, to be acted out by both a pair of identical women and men. Allowing men to party while wearing bunny ears is a recent development for Unicode, but it was among very few emojis adapted to “IRL” gifs by GIPHY this week. Do you feel represented in society yet? You can view GIPHY’s entire collection online, and use it across devices for free. Happy World Emoji Day. Or, you know, ㊗️🌎📱☀️.